Freemasonry is a fraternity for men, with a worldwide membership of around 4 million. Local branches are called 'lodges', and the members meet together and perform rituals teaching moral truths, similar to short plays, supposedly based on Biblical imagery mostly concerned with the building of Solomon's Temple in Jerusalem. Perhaps the best-known Freemasons appendant body in the USA are the Shriners, who raise funds for children's hospitals and other charities. Membership dues can vary widely between jurisdictions and individual lodges. Meals are often eaten before or after meetings. Lodges also frequently raise money for charity. Truth - being true to himself, his brother Masons, and others around him. The most recognisable symbol of Freemasonry is the "Square and Compass," which is used to teach, respectively, "square conduct towards others" and "keeping passions and prejudices within due bounds". For most jurisdictions of Freemasonry there is a rule that the members must believe in one god or supreme being and in the immortality of the soul. As a result, members of different religions, if monotheistic, are admitted to membership with no expectation that they accept as correct or affirm the religions creeds of any other member. Freemasonry is also illegal in most Islamic countries, including all but two of the Arab states, and Masonic lodges are sometimes called "Houses of the Devil" by Muslims. Sultan Mahmut I of Turkey outlawed Freemasonry shortly after the Pope condemned it in 1738. In 1978 the Islamic Jurisdictional College, perhaps the most important important group involved in Islamic law interpretation, issued a statement condemning Freemasonry, and said, "Any Muslim, who affiliates with it, knowing the truth of its objectives, is an infidel to Islam”. Many right-wingers oppose Freemasonry. These have included David Icke and Alex Jones. There is a degree in Freemasonry called the Holy Royal Arch where an ancient God called Jahbulon is referenced. He is supposed to be a mystic trinity consisting of Yahweh (Jah), God of the Jews, Baal (Bul), a Celtic god, and On, a God of Egypt also named Osiris. Contrary to popular belief, Freemasons are not taught to 'prefer' other Masons or to do them special favors. They are pledged, however, to come to the assistance of other Masons if they are in need, so long as this does not involve any violation of one's ethical standards or imperil the well-being of the assisting Mason's family. When a lawyer puts his hand in his jacket, this is a Masonic symbol. The lawyer is asking for help from the judge, if the judge is a Mason. Another symbol for help is the raising of both hands in the air, accompanied by saying, "Is there no help for the widow's son?" Standard Freemasonry is divided into three degrees: Entered Apprentice, Fellow Craft and Master Mason. The Mark degree can be gained after Master Mason but is considered to be an expansion of the Fellow Craft degree. The degree ceremonies traditionally involve participation in a number of stylised scenes from the building of the Temple and a series of moral lessons largely derived from the Old Testament and the tools and rituals of operative Masons. After the third degree a Freemason may go on to other Masonic bodies such as the Ancient and Accepted Scottish Rite, the York Rite or the Holy Royal Arch. 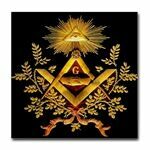 These are considered to be branches of Freemasonry, never "higher" or superior degrees above that of Master Mason. There is little known for certain about the beginnings of Freemasonry. Masonic legends claim various theories about its origins, including some considered, even by Masons, to be improbable. Certainly, lodges of "operative" Freemasons (men who worked stone and built with it) were formed around the major religious and civil work places during the Middle Ages in Europe and the British Isles. These lodges were early societies or guilds for the craftsmen, and places where an apprentice could be taught. The lodges also taught morality. In 1717 four lodges met together at a public house (pub, or hotel) in London and formed the Grand Lodge of England. It later chartered grand lodges in other countries. In 1923 the Italian leader Mussolini ordered through his Fascist Council that members of the ruling Fascist political party who were Freemasons had to give up one or the other. In 1925 Mussolini stated publicly that although Anglo-American Freemasonry was acceptable to him, the Grand Orient Freemasonry of Italy was part of the larger French Grand Orient, which he stated was subversive.He then outlawed Grand Orient Freemasonry. After Adolf Hitler came to power he outlawed Freemasonry in Germany. That year in April, Herman Goering, a German public official, held a meeting with the Grand Master of German Freemasonry, and told him Freemasonry would not be tolerated in Germany anymore. At first Hitler only outlawed the pro-Jewish Humantirian Freemasonic lodges in 1933. But in 1935 he outlawed Freemasonry in all its forms, including the highly anti-Jewish Prussian Grand Lodges. Robert Jackson, the US prosecuting attorney at the Nuremberg trials, stated, "It is not generally understood that among the earliest and most savage of the many persecutions undertaken by every modern dictatorship are those directed against the Free Masons". Wolfgang Amadeus Mozart (1756-1791): musical composer. His work, The Magic Flute, contains many Masonic references. Neil Armstrong (1930-2012): American astronaut. Claimed as a Mason in many Masonic publications, it may rather have been his father who was a Mason. Women are accepted into the social events surrounding Freemasonry, and there are several auxiliaries for female relatives of Masons. The best known of these is the Order of the Eastern Star. Freemasons are permitted both to attend its meetings and become members of the OES. There are some self-styled Masonic organisations that also accept women. These organisations are often referred to by the term, "Co-masonry". A few are exclusively for women. These are not considered "regular" by Freemasons, and men can be expelled from their lodges if they are known to have attended meetings of these so-called "clandestine" organisations. ↑ What is Free Masonry and what do Free Masons believe?